PORTLAND, OR  Many of us in the Northwest have seen and heard the fabulous One More Time Around Again Marching Band (believed to be the largest permanent marching band in the world) at Portland's Grand Floral Parade. It does extend for three blocks! Shouts, smiles, applause from delighted fans greet the musicians and color guard. Some are young, some older, some amateur, some professional  all having the time of their lives. Most are former high school, college and military band members. How did this group get its start? In 1985 Clayton Hannon, then executive director of Rose Festival, saw similar music-makers performing at the Florida Festival of States and brought the idea back to Portland. He advertised in The Oregonian for players, accepted all comers, and ended with 75. Bill Chisholm became the first bandleader and practice was held on a local high school field. By the third year the group had nearly tripled in size, gained a sponsor and purchased yellow bowling shirts and white pants for its public debut in the Grand Floral Parade. 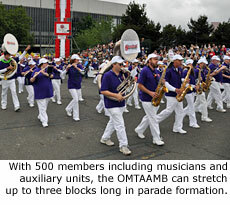 During recent years the OMTAAMB has played around the country  at the Seattle SeaFair, the San Antonio Fiesta Flambeau, the St. Petersburg Festival of States and, in 1990, at the Pasadena Tournament of Roses Parade. Sponsors have been generous and proud of their association. Delta Airlines donated two planes and Red Lion, two hotels, for the Pasadena trip. This year's sponsor is Standard TV and Appliance. Can you imagine organizing and leading 500 musicians so that everyone starts together, ends together and sounds rhythmic and vibrant in between? 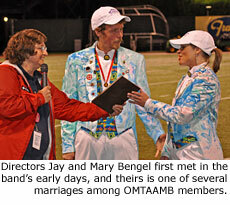 Mary and Jay Bengel have done just that for six seasons. Meeting in the band, Mary was the Drum Major and Jay playing the drums, they had each traveled professionally with musical groups. Evidently both love and leadership ability sparked, and Jay joined Mary as husband and co-director. Mary rehearses the band, usually 300-400 strong at practices, and acts as spiritual and emotional coach  exhorting depth and feeling in the music and generally serving as "mother-figure." (She once conducted a concert while nine months pregnant as Jay monitored her pulse to prevent overexertion.) 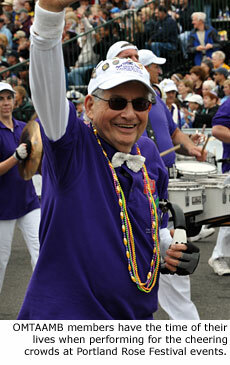 Jay chooses music, 50 to 60 songs, selects uniforms, hats, pins  and leads the band. He keeps the music current  all of his duties commanding a commitment of many hours each week. Together, they "live" the band  along with the able assistance of a strong, long-term logistical staff and Rose Festival directors. What communication and attention to detail it must take to keep this organization going  especially when most who are involved have jobs, families and other time constraints! While the majority of members live in the Portland area, several fly in each year just to perform with the group. Most recently, players have come from California, Florida, Ohio, Pennsylvania, Japan and New Zealand. Quite a few members are band teachers and professional musicians who love the camaraderie and joy of making music. Their expertise is also appreciated! Occasionally, there is a visiting guest conductor or artist. The Kingsmen of Louie Louie fame, symphony conductor Norman Leyden, and pianist Michael Allen Harrison have performed with the group. Mary Bengel teaches music at a middle school and the band currently rehearses there. On warm spring and summer evenings, doors and windows in the area open wide as neighbors enjoy the unofficial concert. Residents of an assisted living facility nearby are an especially appreciative audience. Mary and Jay stress that this band is really a big family and that they, as leaders, gain as much as they give. Often, fathers, mothers, sons, daughters play together and people stay around for a long time. Thirty-two charter members are still members! In some cases, when the body is no longer so adept at marching, there are other jobs to do  working with volunteers, logistics, checking on instruments and players. Marriages do take place, divorces and deaths happen  all eliciting emotion and support from the group. Joys and losses are shared and deeply felt. Members say that they continue to grow, to learn more about music and about themselves  enriching their own lives while contributing to, and entertaining, their community. Through music, there is a motivating reason to keep going through rough patches, to learn skills from others, to create a great sound together. Music creates a common ground, a shared wavelength. After 9/11 there was a special patriotic suite of music played at 2002 performances where the rendering of America the Beautiful, Amazing Grace and Sousa's Stars and Stripes Forever brought tears to everyone's eyes. There is great economic and social diversity within the group  people coming from many different backgrounds. There is not much prejudice in shared music! Nowadays, applications are made and auditions are conducted for all prospective members. We all can visit their web site (www.omtaamb.org) to check procedures, repertoire, current schedules, to view photos and to learn more. Songs for this year's performances at Rose Festival events in Portland will include Land of 1,000 Dances, Mercy, Mercy, Mercy, Shake, Green Onions, Watermelon Man, Hold on I'm Comin', Messin' with the Kid, So Very Hard to Go, Groove Me, Play That Funky Music, Georgia on My Mind, and Louie, Louie. Doesn't it all sound like fun? Related story: Portland's giant marching band invites adults to join and march "one more time"
"The One More Time Around Again Marching Band" by Marlys Chapman�was first published in Open Spaces (Volume 7, Number 3, 2005), www.open-spaces.com. This copyrighted�article is reprinted here�by permission of Open Spaces and�the author.